Some of the most popular farmhouse vintage furniture types are made of reclaimed wood. Oak is one of the most popular types because it is incredibly durable and can last for decades – even if it has already been utilized before. Finishes and particular designs can vary, of course. Furniture featuring rustic design often has a chunky shape and is often made of oak. However, walnut and pine are also quite popular. The main advantage of rustic design is that looks very warm in any room. In fact, more and more living rooms are now being equipped with rustic furniture, which looks especially impressive in rooms with protruding wooden beams and other architectural elements that match the picture. 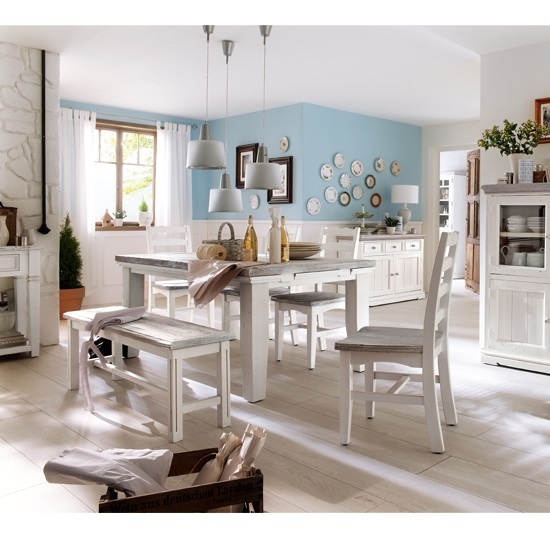 Another great solution is to equip your home with distressed furniture. You can easily buy some ready-made solutions, or distress some of your older units yourself. Distressed furniture looks especially good in hallways and conservatories. It can also become a stylish addition to certain kitchens. Another great, non-distressed option is to go with painted or tarnished wood. If you choose paint, it is possible to find practically any colour you have in mind. Yet, white remains an undeniable champion in the market. Tarnished wood is usually darker and it is perfect for creating contrast in the room. And, of course, it is possible to find some genuine antique solutions at specialized stores. They, however, may cost you an arm and a leg, which is why going with vintage but newly produced furniture is a more reasonable solution for an average homeowner.